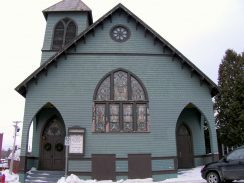 The Winooski United Methodist Church, a modest green-painted wooden structure with two gothic-arched doors and a single unassuming steeple, hosted a line of people streaming out of the front door and onto the curb. I stood at the back of the line, taking in the scene. The small crowd of young, artsy Vermonters bore little resemblance to a typical Sunday morning congregation. Indeed, it was a Saturday night, and if these people came here to worship, they were certainly doing so in an unconventional way. They were waiting to see Phil Elverum (better known by his moniker, Mount Eerie) play and sing alone with his acoustic guitar. The beloved singer-songwriter’s newest release was A Crow Looked At Me, an intensely emotional stream-of-consciousness elegy to his late wife, Geneviève Castrée, who recently lost a battle with pancreatic cancer. The sold-out show was a testament to the power of Elverum’s lyrical art. The crowd’s size and reverence indicated how many hearts Elverum had moved with his brutally honest musical memoirs. Upon entering the building, it became clear to me why Elverum had chosen a small church venue over a typical crowded bar atmosphere to perform his soul-baring music. A church employee who looked younger than me sat alone by the door, smiling warmly and furnishing will call tickets with a pen and paper. Inside the church, many rows of pews had been set up to accommodate the seated show, and Elverum’s guitar leaned against the wall on a small, minimally-lit stage. A beautiful set of organ pipes sat proudly up on the front wall. In the back, three middle-aged women sat at a table selling bottled water and snacks in plastic bags. Proceeds from these sales, I later learned, would go toward fixing the floor of the church’s basement. I went to the basement to use the bathroom, where the floor indeed yearned for renovation. While waiting in line, I happened to speak with one of the organizers of the concert, who told me that Elverum was touring with his 3-year-old daughter (his daughter features prominently in his recent lyrics, but Elverum understandably does not wish to publicize her name). Tonight, just like every night of the tour, he left his daughter with a nanny while he performed. This personal detail struck me, not only because I was relieved to know that Elverum hadn’t left his daughter at home in Washington during a several-month-long tour, but also because it reminded me of the strange reality in which Elverum is currently living. Hundreds of thousands of people around the world have listened to his intensely personal, complexly detailed reflections on his own life. His life reverberates through speakers and headphones and turntables and car stereos and MP3 players and streaming platforms, and meanwhile he’s still living that same life, even while on tour, singing these detailed stories for total strangers. I wondered how Elverum feels about living this kind of life. I wondered if it brought him comfort, or perhaps made him anxious, to share these personal stories so publicly, to bring listeners all across the world closer to understanding his pain, his grief, his loss—without ever truly understanding it, if they have never lost someone very close to them. I headed back up the stairs and sat in a pew. The show began promptly at 8, as advertised—something that would never happen in an ordinary indie venue. It felt strange to see Elverum, someone whose music I’ve loved for many years but have never met in person, pick up a guitar in this small church and start the show without much fanfare. He asked us if we were hydrated, and he warned us that the show would go on for over an hour and that we ought to drink water if necessary. Then he dove right in, starting with a new original song, presumably one that he’d written after finishing his latest album. It turned out that nearly half the show consisted of these newer post-album tracks, which tended to be longer, more specific, and more detailed than the songs from the album. Some of the songs told stories from his past; the first song, for example, related a time when he almost accidentally became a father at age twenty-three (he’s now thirty-nine). Despite the overall sad tone of the song, he used self-deprecating humor to describe how this pregnancy scare nearly ruptured the fabric of his young, careless, bohemian life, and forced him to reflect on how easily life can be created and destroyed. Other non-album tracks made some headway toward answering my questions about what his life was like, and how his emotional and mental state was, after finishing the album and while embarking on this tour. He acknowledged that the pain of losing Geneviève was fading, but he was also afraid to let go of the pain because it was attached to the memories he had of her. He reflected on the “crushing absurdity” of death, musing that although his pain was so intense that he almost felt it could only be his and his alone, he recognized that “people get cancer and die, people get hit by trucks and die”; i.e., the pain of loss is a very common pain, and he is not the only one to have experienced such intense grief. 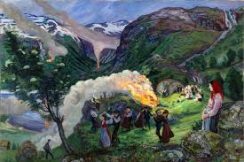 He expressed kinship with other mourners while reflecting on the Norwegian painter Nikolai Astrup’s “Midsummer Eve Bonfire,” in which a melancholy woman looks on as a group of villagers dance around writhing flames in a picturesque yet somehow ominous valley. In Elverum’s interpretation, the woman seems to have “lost her person, just like me.” Perhaps Elverum hopes that others who grieve can find kinship in his art, just as he finds kinship in others’ art. I could tell that Elverum had rehearsed well, because the tracks from the album sounded just like they did on record, except that the already stripped-down songs were stripped down even further to only one voice and one guitar. The complex lyrics and melodies were all perfectly memorized, and the often-fingerpicked guitar lines drifted easily from his skilled hands as he sang. Even many of the vocal imperfections that make Elverum’s voice so uniquely, inexplicably heartrending were exactly the same live as they were on record. I wondered how it felt for him to rehearse these songs constantly, to breathe these songs day in and day out, playing them again and again in a different city every night. He talked minimally between songs, once noting how strange it was to hear applause after a song that ends with the line “It does not feel good.” By acknowledging the strangeness of the whole scenario, he alleviated the room’s tension to some degree. To be an audience member for such personal music inevitably comes with a slight feeling of guilt, as though you’re intruding on someone else’s private thoughts and experiences for your own personal pleasure. Applause, however, was the only way we could show appreciation for the tremendously compelling art that was being performed before our eyes. There was a certain bizarre unspoken bond between audience members, as we experienced a rare moment of collective rumination on death. At the end of the show, Elverum shuffled modestly toward the merch table, where he sold his own merch without any help. He swiped my credit card with his iPhone as I bought a tour poster that displayed a woodcut-style image of a chair at the edge of a forest. I inferred that this chair represented the one referenced in the song “Seaweed.” In the song, Elverum recalls a day when he traveled to the remote island where he and his wife had hoped to move before she died. He sings, “I brought a chair from home / And I poured out your ashes on it, / I guess so you could watch the sunset. / But the truth is, I don’t think of that dust as you: / You are the sunset.” I left the church, feeling the cool, refreshing outside air on my body and a mix of emotions that is difficult to articulate. I had hoped to meet Phil Elverum for years, and it finally happened, right after I’d learned more personal information about him than I know about many of my own friends, after I had just spent an hour thinking about death with hundreds of other people in a church. I headed back to Middlebury in an introspective state of mind, wanting only to feel more connected with other human beings, knowing that all our flames will eventually be extinguished.